I learned today that a picture really is worth 1,000 words. 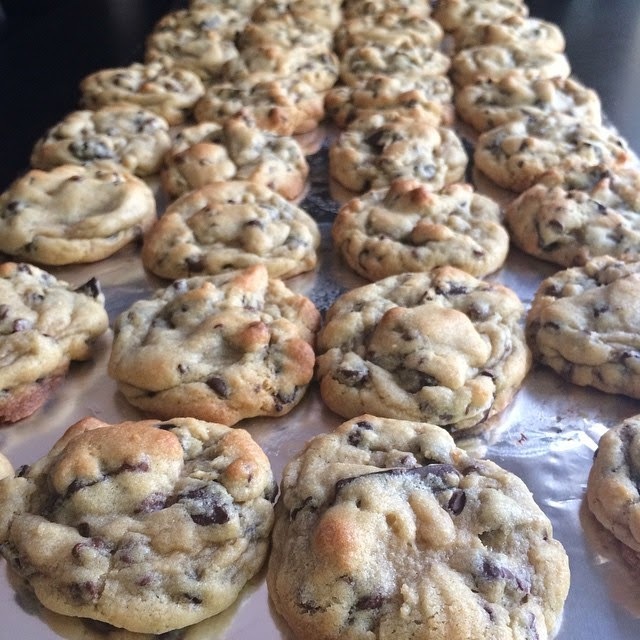 All I did was post a photo of some cookies I baked for a friend and - *BAM* - dozens of requests for a recipe. They do look amazing, right? I promise they taste even better! Refrigerate dough for at least* an hour. I prefer to let it set overnight, which is why I love this recipe- you can whip it together right before bed in ten minutes, then bake the next day (or three days later!). *I promise you if you don't let these set/chill, they will turn out very flat and crispy, which is not at all what you want. Bake for 10 minutes at 350 degrees. Some ovens may take 11. You want them to only have the lightest of brown on the higher points of the cookies. Let cookies develop on sheet for two or three minutes. Use spatula to remove and place on whatever surface you use for cooling - I use a sheet of wax paper or tin foil. Nothing fancy. The cookies may seem to be gooey or more likely to fall apart, but they will solidify upon cooling.